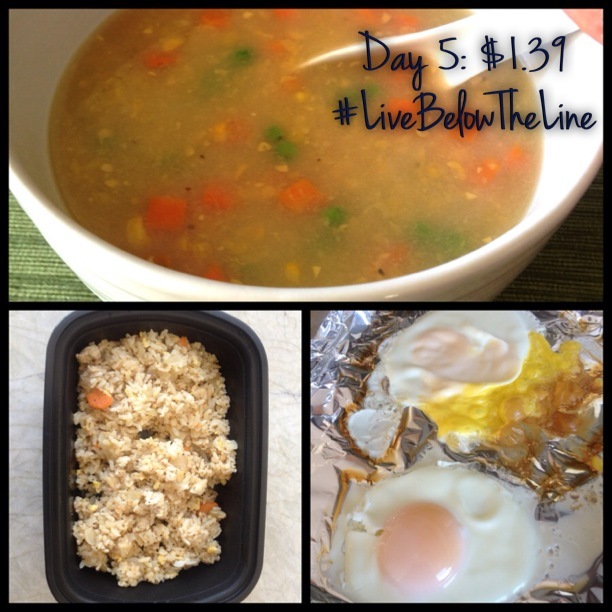 This past week Ben and I have been participating in the Live Below The Line challenge, which involves spending no more than $1.50/day on food for 5 days. The $1.50 represents the US equivalent of the global extreme poverty line. The reason? Awareness. 1.4 billion people in the world live under $1.50 a day or less. 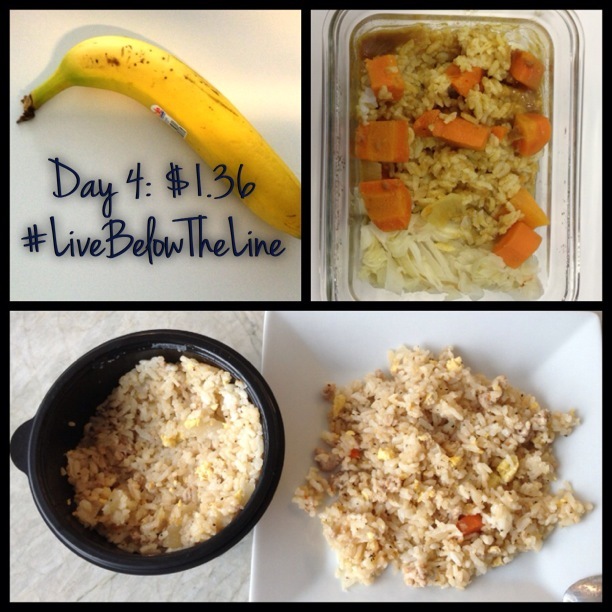 You may pool together funds and share the cost of ingredients amongst a team….meaning, Ben and I pooled together $15 to create 30 meals. The full cost of all the items you consume must be included in your budget. This means budgeting for whole packages of food such as rice, pasta, noodles and eggs etc……so we cheated here because we’re Asian and always have 15 lbs of rice on hand. Just wouldn’t make sense to buy a small package of rice. Planning. 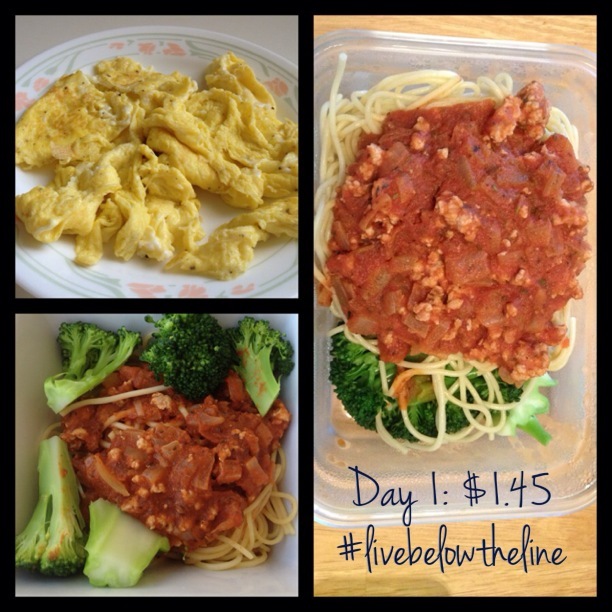 Calculating and picking out 5 days of meals well in advance. Figuring out the cheapest places to buy groceries. Most everything was bought at the Chinatown grocery store except for bananas, peas and carrots, and ramen, which were bought at Kroger. Hunger. Part of the hunger was mental because it made me hungry knowing that I couldn’t just eat whatever and whenever. The other part was because there wasn’t much protein or calories in our meals. Temptation. So many times I felt like cheating and driving through McDonald’s and getting a $1 spicy chicken sandwich and maybe cutting it in half. DAY 2. Breakfast: Banana ($0.13). 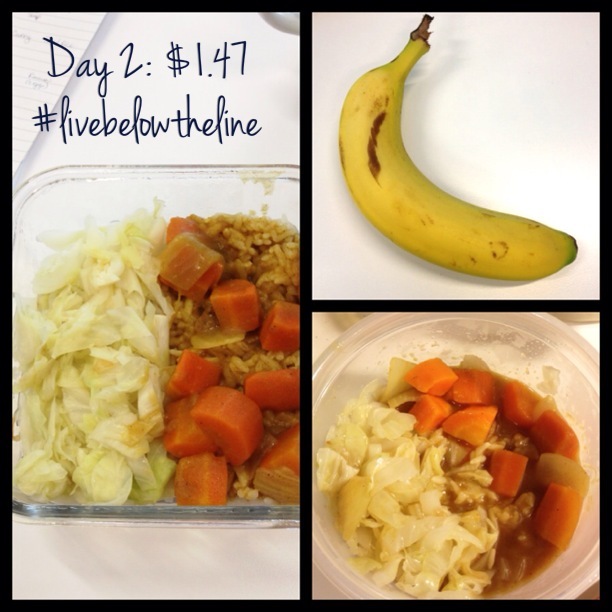 Lunch: Curry with carrots and onions ($0.46), cabbage ($0.21). Dinner: Curry with carrots and onions ($0.46), cabbage ($0.21). 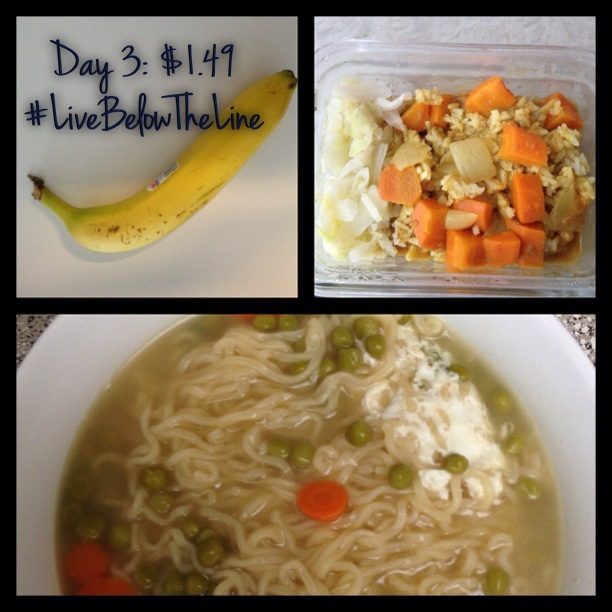 Total: $1.47. I would be lying if I said that Ben and I have been totally changed after this experience. Instead, here’s a few things that we’ll be more mindful of. Minimizing waste. Putting the extra effort to maximize ingredients. Taking home and eating leftovers. Overeating. Makes you think twice about being glutttonous.